Kohler is one of the oldest privately owned companies to exist on the planet today, and it’s all thanks to a man named John Michael Kohler. Surprisingly, the name was catapulted into the spotlight at the end of the 19th century when Mr. Kohler coated an iron hog scalder in enamel and marketed it as a bathtub! Since then the company has gone from strength to strength, and they design and manufacture complete kitchens and bathrooms with all the accessories in between. 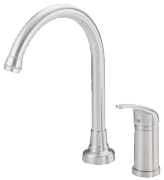 On my website you will find their kitchen faucets which champion the sense of innovative style with convenience not many other companies can match.